Some of the 20 different types of rice used during the three-month festival Kochi-Muziris Biennale in India. Chefs served two varieties of rice every day, along with multiple dishes of vegetables and meat or seafood. 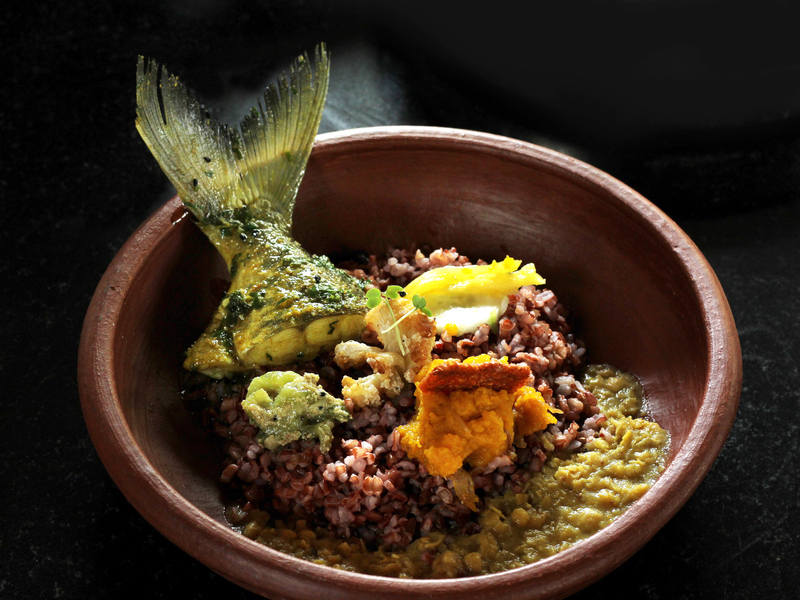 Chef Anumitra Ghosh Dastidar fondly remembers her father's love for rice — and his insistence on having specific kinds of rice — with each special meat or fish dish cooked in their kitchen. She even has memories of him making long road trips from their home in Kolkata, India, to other parts of the state of West Bengal to buy local rice. What motivated him, she says, was not just his interest in food but also nostalgia for his childhood. Edible Archives was born partly from this recollection, with chef Anurima Ghosh Dastidar as curator, along with chef Prima Kurien and two food writers who were also invited to cook. India is known to have cultivated thousands of varieties of rice, and references to rice — also combined with vegetables and meat, an ancient precursor to biryani, which came from Persia — have been found in Sangam literature from the 5th century B.C. Even a century ago, communities across India grew their own strains of rice, and consumed them according to the needs of the season or the cuisine. During the Green Revolution in the 1960s, when machinery replaced manual work and "high-yield variety" seeds were promoted, agricultural output increased dramatically, but a few hybrid rice strains took over from hundreds of indigenous ones. 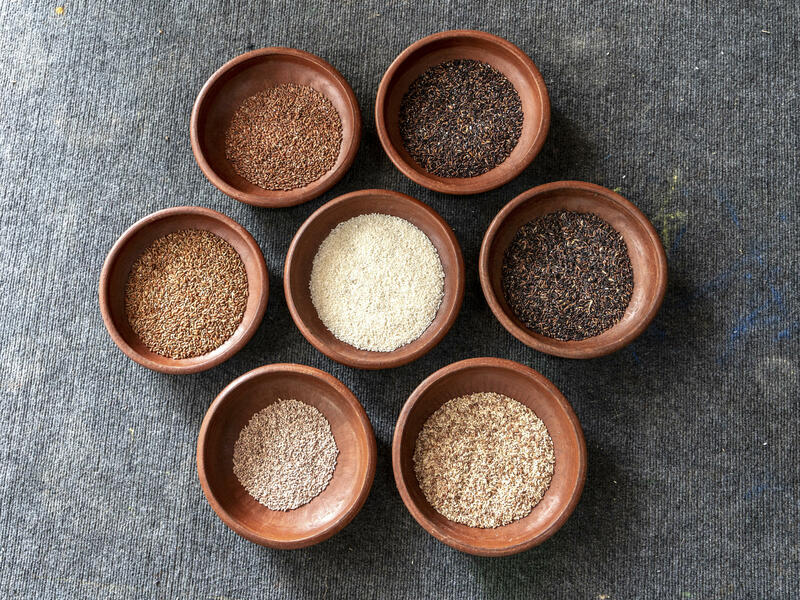 The Edible Archives Project aims to showcase the sheer range of rice varieties grown in India, and throw the spotlight specifically on those which have almost vanished from the country's foodscape or are grown only in small communities. 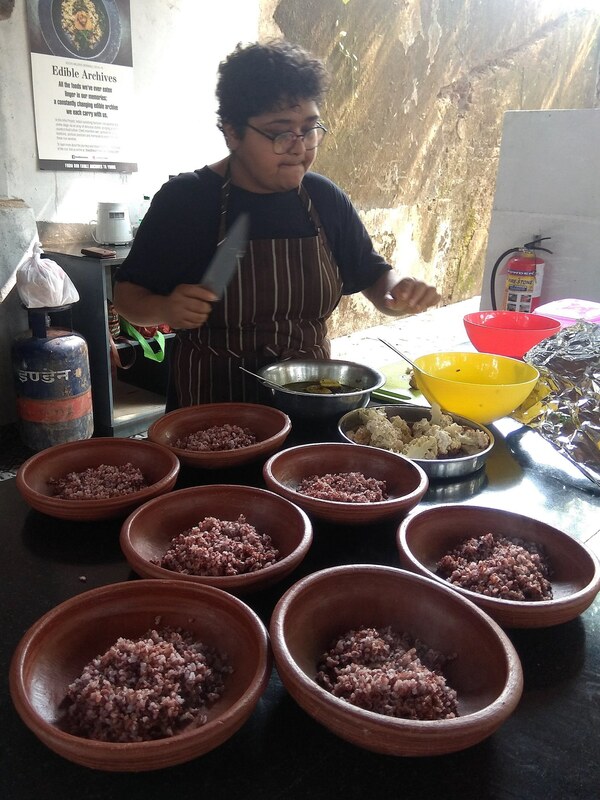 Chef Anumitra Ghosh Dastidar scoops Kattuyanam (a red rice from Tamil Nadu), into bowls at the Kochi-Muziris Biennale. She is instrumental in both rice research and cooking for the Edible Archives project. "We don't document anything in India, so most of the old rice strains are gone, and the expert knowledge about them too," says Jayanthi Somasundaram, whose Spirit of the Earth collective sources and sells several varieties of organic heritage rice, including a few for this project. Edible Archives formally opened at the Kochi-Muziris Biennale, an art festival that ran from Dec. 12 through March 29 in the south Indian city of Kochi, currently in its fourth edition. At the event, the chefs served two varieties of rice every day, along with multiple dishes of vegetables and meat or seafood. All of this was in what Dastidar calls "homestyle cooking" (as opposed to what is passed off in restaurants, especially outside India, as classic Indian cuisine, like butter chicken), using local vegetables such as drumstick (moringa in vegetable form) and gourds. Writer-chef Priya Bala adds that the idea was also to present not just rice in all its glory, but preserve the dwindling knowledge about cooking methods, as well as revive lost recipes. To spice things up, the chefs also played with fusion presentations, such as a Korean marinated egg over the aromatic Tulaipanji rice from West Bengal (a hit combination, as it turned out) and the Chicken Pepian, a Guatemalan Maya dish paired with the white, sweetish Chini Atap rice, also from the same Indian state, to complement the robust smokiness of the meat. "Most importantly, the chefs also explained how pairing works, so as to balance all flavors and fragrances," Somasundaram says. In three months, the team cooked with nearly 40 rice varieties from all over India, many of them not familiar to anyone outside the region of cultivation — like the Bahurupi from the state of Odisha or the Kattuyanam from Tamil Nadu. The rice of the day was described on a board at the venue, and on the social media pages of Edible Archives. Drawing from her own nostalgia, Dastidar says that most Indians have "an archive of rice memories, which we wanted to bring together." In the midst of all the cooking and eating, there was also a two-day workshop called "Recipes of Rice and Remembrance" that included talks, cooking demonstrations, reminiscences and even songs related to rice. Speaking of the latter, Bala points out that rice has found a place in Indian culture and literature over the ages, from a Bengali lullaby asking the angel aunties to come and put the baby to sleep, promising them delicious food in return — including three types of rice — to devotional songs from the state of Tamil Nadu that equate rice with prosperity. Indeed, rice has been an important, exceptional part of Indian rituals — from the ceremony during which a baby is first fed mashed rice as solid food, to the turmeric-infused yellow rice showered as blessing at weddings, to the final journey, where rice is an offering to the departed soul. Even the sick are fed kanji or khichuri (loose rice porridge, with or without lentils) as comfort food. Dastidar has trained in Italian, Japanese and Thai cuisines, and learned how chefs in those countries tend to focus on grains from their own microregions. Much before the Edible Archives idea took shape, Dastidar was experimenting with rice varieties; think Manipuri Black Rice Risotto (a grain with starch content similar to Arborio) at New Delhi's popular restaurant Diva, where she was sous chef for many years. With this experience, she traveled across the country to source the rice for Edible Archives — all of it was bought directly from small farmers or through agriculture collectives and non-governmental organizations who worked with cultivators. The exploratory phase included inputs from experts such as Dr. Debal Deb, who has researched and grown 1,300 varieties of rice at his farm Basudha in Odisha, and organic farmer Syed Ghani Khan, who established a rice museum in Karnataka that is home to more than 850 varieties. One of the rice bowls served at the festival, this dish contains Kattuyanam, along with roasted pumpkin, cauliflower, ridge gourd, mango, dal, and cucumber salad and mustard microgreens. Along with creating a record of cultural connotations and memories, Edible Archives also shared nutritional information about the rice of the day, trying to dispel the myth that rice is just a "bad carb." Case in point are two varieties from Tamil Nadu, where rice is the staple: Kattuyanam and Seeraga Samba, the former with a low glycemic index that makes it ideal for diabetics, and the latter highly fibrous and rich in selenium to fight colon and intestinal cancers. The chefs gleaned this information from scientific articles and agricultural journals, as well as from Basudha's in-house magazine. In the future, Edible Archives plans to hold pop-up events across the country and eventually abroad. There have already been a few in Indian cities, and one in Paris coming up in June that will focus on cuisine from India's seven northeast states, which are still largely under-explored in terms of tourism, culture and cuisine. The chefs say they mean to keep the dialogue going with talks and lectures "wherever food and culture meet." As Bala puts it, "we need to continue the celebration of a grain that is sustenance, comfort, nutrition and auspiciousness all at once."